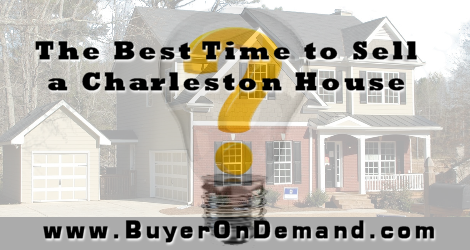 Home / Blog / When Is The Best Time to Sell Your Charleston House? If you are planning on selling your Charleston house, chance are you may have a few questions. Don’t feel that you are the only one, after all selling a house is not something many people do very often. It is not unusual at all to have a few questions when it comes time to sell your Charleston house. All good questions, and we will help you figure out when it’s the best time to sell as well as the fastest way to sell your house! They always say people are buying houses in Charleston during the the spring and summer. School is out, relocating becomes more tangible and the weather is conducive for going house hunting. Statistics show more people are buying when it’s warm, so you will likely have a larger pool of prospective buyers! Start with spring cleaning to prep your home, and get ready to list it in sometime between April and June! In some parts of the country, houses are selling 1-3% higher in the month of May. Do your homework and research annual housing trends for your particular neighborhood! If you have questions,Charleston Property Solutions is happy to help you review historical trends! While summer is preferred by many people, there is something to be said about not doing what everyone else is doing. Selling in the off season can have its perks as well. Your pool of buyers might be smaller, but the pool of available homes will be as well. This is your chance to make your home stand out from the one across the street. Less competition on the market, might mean a bigger reward for you! What is the Fastest way to sell your Charleston house? Wanting to sell your Charleston home quickly without the hassle? If so, we can help you sell your house fast! Give our team a call! We are ready to answer all your questions so you can sell your Charleston home fast! (843) 478-7206 or complete our home seller questionnaire!